When used appropriately, plastic badge holders enhance branding, security and other business relations. What Is a Badge Holder? A badge holder is a rectangular, plastic identification product with an opening to insert a card or paper. People often use badge holders for trade shows, conventions, meetings and conferences. Badge holders come in different sizes and have a horizontal or vertical orientation. A fastener is usually attached to the plastic holder, such as a pin, clip or magnet. 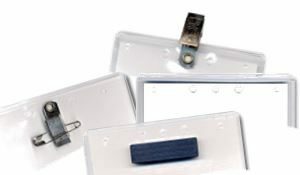 Badge holders also have punched slots for attaching a lanyard or metal chain. Customers can write on the paper or print any text or graphics using a printer. The purpose of a badge holder is for someone to wear some form of identification so that it is visible and accessible. People also use badge holders to carry essential items like security cards, so they are easy to find. Employees are less likely to lose their security cards or credentials when they keep them in a badge holder. The holders make it so that companies do not have to pay to replace any lost items. A badge holder also holds the card or ID in view so that security personnel and coworkers can quickly identify the person wearing it. Some people prefer badge holders because they can wear them with a lanyard. The wearer does not have to poke holes in their clothing with a pin and damage their shirt or blouse. And the plastic material keeps the cards from breaking or getting scratched. 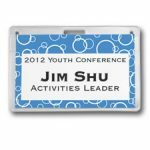 Badge holders are a less expensive alternative when custom name tags are not within a company’s budget. Name tags are also inconvenient when companies have high turn-over rates. 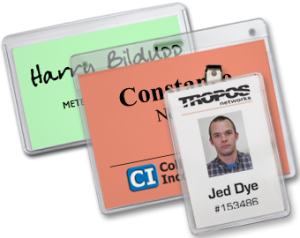 With badge holders, all a company has to do is replace the former employee’s identification with the new ones. Conferences and conventions use badge holders for the same reason since different people may attend each year. It is crucial to know who is entering a building or facility to maintain a high level of security. 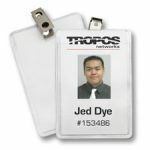 If employees wear their photo identification in a badge holder, security personnel can see who has authorized access to the building and who does not, which can decrease theft, impersonation and unauthorized visits. Employees can also use badge holders to carry proximity cards to tap in and out when they enter or leave the building. By giving people this access, it allows security to keep track of who is in the building. Identification items like badge holders help foster work relationships. People are more trusting and open with others when they know each other’s names. When employees wear something with their name on it, it improves work relationships. Additionally, this helps customers feel comfortable around employees. New employees get to know their colleagues and adapt to their work environment faster. So, when employees use badge holders like name tags, it enhances the company internal and external relations. Adding a company logo to badge holder inserts increases brand recognition. People associate the logo with the company when employees wear their badge holders at conventions and trade shows. Employees should wear their badges in the office, during their lunch break and when they travel to and from work. Companies can also require employees to show their work ID to access benefits like restaurant discounts and gym memberships. Using an ID in this way becomes free advertising for the company and makes the logo more memorable to the public. Even within the office, having employees wear the logo creates a sense of teamwork and loyalty to the company. For badge holders to benefit businesses, the text on the badge inserts must be readable and straightforward. Print only the person’s name and their job title and department. In retail establishments, the only requirement is the first name. When two employees have the same first name, have them include their last name or initial as well. The text on the insert should be at least a 24 point font or larger. Make sure the ink and the font style are legible. Print the same information on both sides of the card if the badge holder is attached to a lanyard. Lanyards tend to twist and turn so that the badge holder is facing the other way. If the information is on one side of the insert, it will not be visible when the lanyard turns the badge around, which defeats the purpose of the badge holder. The layout of the name and logo needs to look tidy and professional. A business logo should not be so large that it makes the insert look crowded. On the other hand, the logo should not be too small and hide in one corner. At trade shows, if there is enough room on the insert, it may include the company’s Twitter handle and other social media or a QR barcode that leads to the company’s website. Social media and barcodes should all be neatly laid out on the insert. Treat titles the same as logos. If included on inserts, they must never crowd the person’s name or be in a small, unreadable font. Job titles distinguish head of staff from other employees. Titles also help customers and employees know who to talk to about specific issues. 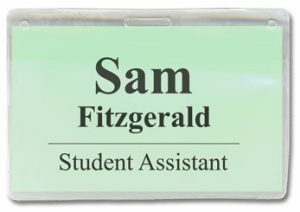 Putting titles on badges let customers or conference attendees know who is in charge of management, security or registration. Photo IDs and security cards should fit inside the badge holders. So, make sure you are ordering the correct size. Each badge should also be the proper orientation. If the IDs have a horizontal direction, then the company will need a horizontal badge holder. It is the same for vertical IDs. If you are using paper inserts, be sure to use badge holders that will present your information appropriately. Standard text should be about 24 point font, and all text must be large enough to read from a slight distance, usually about 10 feet away. The best choice of fastener depends on how people wish to attach the badge holder to their person. Professional badge holders come with many different fastener options. Some like it on their clothes while others want it hanging from a lanyard. Fasteners, like pins and magnets, are often used for formal settings while lanyards are used more during conferences and conventions. Magnets and pins attach badge holders to people’s shirts, blouses, suit jackets or some other articles of clothing. The slots on the top of a badge holder are made to wear with a lanyard or a clip. And, clips can be attached to almost anything, whether it is a shirt, jacket or any other piece of clothing. Finding the right kind of material for your badge holder depends on how excessively you intend to use them. You can order badge holders made of different types of plastic. For example, holders with 8 to 10 mil vinyl are durable and suitable for repeated use. Vinyl is a plastic consisting of polyvinyl chloride. Badges with less than eight mil vinyl are semi-rigid and ideal for light use. And, holders made of acetate, a material made by cutting and polishing sheets of plastic, are flexible and lightweight. So, they are thin and recommended for single use. Inserts are available in seven colors. Ordering different colored badge holder inserts so that badges can be color coded. And, color coding allows companies can divide employees into several groups. Color coding can visibly show who has permission to access specific areas of a facility. Different colors can also designate who works in which department. At schools, these colors can differentiate between students, faculty and staff. For trade shows or conventions, color coding can separate attendees from volunteers and vendors. Whatever the color of the insert, the text should be easy to read. So, do not use light printing on a light colored insert. Specific job fields should use badge holders for identification to earn people’s trust and improve credibility. If people are going to trust someone with their well being, they want to know they are experts in their field. People also want proof that a journalist who is asking to interview them works for a news organization. Those who work these types of jobs are more likely to receive the public’s trust when they show their credentials or identification. People receiving medical care want to know they are in the right hands. For that reason, doctors, nurses and emergency medical technicians should include their name, photo and job title on their work ID. With this information visible, people know they are legitimate. 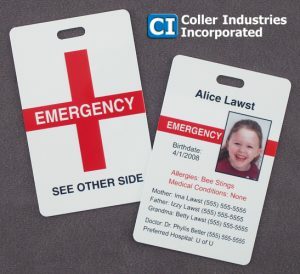 People with a chronic medical condition can make their emergency medical ID with a badge holder and paper insert. Medical IDs should include information about a person’s medical condition, medication and food allergies, prescribed drugs, emergency contacts and blood type. Often people with a mental state have trouble remembering which medication they take and how much. If a person becomes unconscious due to a health condition, a medical ID can give people the correct medication and dosage that person needs. The wrong medication or dosage can have fatal consequences, which is why medical IDs are essential. Anyone with a chronic medical condition should have a medical ID card. These cards are also perfect for participants in clinical trials and people with special needs. EMTs are trained to look for medical ID cards and use the information provided to save a person’s life. Make sure to order a high-quality badge holder and insert card for your medical ID. The text printed on the medical ID must be readable and well organized. Use good quality ink that does not fade quickly. A badge and lanyard are much more readable than a bracelet and more accessible. Also, be sure to have the information printed on both sides of the insert. The insert card must include all necessary information. If there is not enough room on one side, print the rest of the details on the other. It is better to use both sides of the card and have the text in a larger font than to have everything on one side. Badge holders can help schools that wish to increase their level of security. Administration can require students, faculty and staff to wear badges while on school property. School badges indicate that the people wearing them are allowed on campus. And, this makes it easier for faculty and security to spot anyone who might be trespassing. For badges to efficiently work in schools, everyone should wear them the whole time they are on school property. Each student, teacher and staff member should return their badge to administration when they no longer work at or attend the school. Administration can also require authorized visitors to obtain a visitor pass and wear it while they are on school property. Once done visiting the school, visitors should return the pass right before they leave. Badge holders with lanyards are one of the best options for school use. Students can slip them on and off without damaging the badge. Schools can customize the lanyard and badge inserts to include the school’s name and logo. This customization helps security personnel distinguish between a legitimate school badge and a fake one. School badges can also help administration keep track of which students borrow books from the school library or borrow equipment for educational purposes. They can also indicate which students have paid for a meal plan.